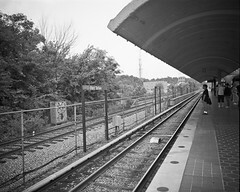 Metro announced this afternoon that they will hold a remembrance ceremony at the Fort Totten metro on June 22nd at 10am, to remember the accident that claimed the lives of nine riders last year. The families of the dead will also dedicate a plaque to their memories, and lay a wreath in honor of all victims. It’s hard to believe it’s been a year since the deadly crash. The system is still operating in crisis mode, with no clear timetable to resume normal operation, and the city’s relationship with WMATA is on the rocks. It’s hopeful that the release of the NTSB findings will begin to put some milestones in place for Metro to work toward, and more importantly, talk about publicly. While they wait for the NTSB to write the final report, their hands are very much tied about what they can say publicly. The text of the plaque is after the break. The plaque is a nice touch. Now fix the system that caused their deaths in the first place, guys.